Hailing from Bern, Switzerland, The Jackets are Jack Torera (aka Jackie Brutsche) on vox/lead guitar, Sam Schmidiger on bass and Chris Rosales on drums. With a combined love for The Seeds, The Music Machine, The Lyre and The Gravedigger V, The Jackets boast an exposition of untamed garage rock that is uniquely executed. It’s a style that is well refined, raw and carefully delivered. I would have thought it would have been hard to top their last record, but it’s not necessarily a surprise that this single breathes new life into their already vibrant sound. The Jackets’ single captures the ferocity of their sophomore album, Way Out, while blending together the freakbeat notions found in Shadows Of Sound. Co-written with King Khan of King Khan and the Shrines, Be Myself/Queen of the Pill was recorded in Berlin, Germany by Nene Baratto of Movie Star Junkies. The A-side, “Be Myself,” is an awesome assault on the senses. It’s immediately in your face with fuzzed-out guitars and vocals reminiscent of Shocking Blue. This track carries the damning urgency of punk while holding steadfast as a raucous 60s garage rock ripper. Like the title suggests, it’s a song that demands that one makes their own way in spite of any adversity. 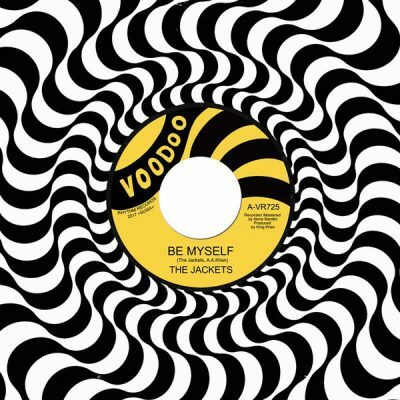 Despite a theme that is almost played out by those who have come before, The Jackets’ “Be Myself” own it by charging new life into rock n’ roll rebellion. On the B-side is “Queen of the Pill.” In contrast to the straight garage punk tune on the A-side, this track comes out as a psychedelic stomper. This track superbly utilizes a straight and reverbed guitar that draws me in—it’s not through long-windedness, mind you, but with overwhelming, gritty heaviness. If anything, this is the song that shows the maturity of Shadows of Sound. It’s still got a strong freakbeat feel, but with something decisively more wicked and distorted. Rumor has it that this single is just a taste of a new album in the works from The Jackets. If this is true, then I can hardly wait. The Jackets are a group that does something actually interesting with garage punk. Their sound is that of an angst-driven rebellion that propels the desperation of punk while drumming up a sense of maturity suitable for teens in their garage. All together and with the proper attention, this is music that should blow away any mediocrity muddling the contemporary garage rock genre. The Jackets don’t mess about with dreamy notes. Rather, they lay bare what rock n’ roll should be taken as—sounds to provoke and move to.